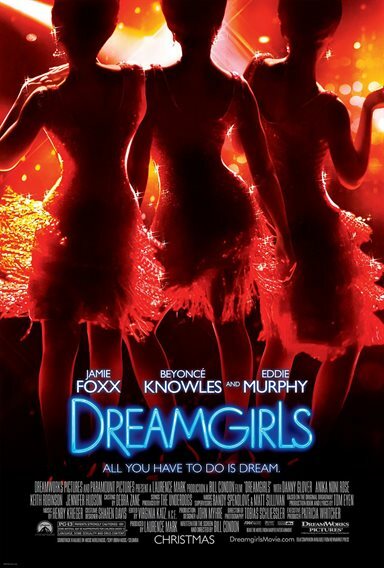 Download Dreamgirls in Digital HD from the iTunes store. Dreamgirls images are © Paramount Pictures. All Rights Reserved. In 1981, a musical by Henry Krieger and Tom Eyen called Dreamgirls hit Broadway. Based on the 1960's R&B acts trying and somewhat succeeding to make it in show business, it was nominated for 13 Tony awards, ultimately winning 6 plus two Grammys as well. In 2006, Bill Condon (Beauty and the Beast – 2017 live-action film) wrote and directed a movie version that won two Oscars and launched Jennifer Hudson's (American Idol) career. While the story seems to have similarities with the real-life drama that supposedly played out behind the scenes of the successful female trio, The Supremes, the creators have denied there is any connection. Effie (Hudson), Deena (Beyonce Knowles; Foxxy Cleopatra) and Lorrell (Anika Noni Rose; Everything, Everything) are the Dreamettes, a girl vocal trio trying to get their big break in the 1960's Detroit show business scene. When they are "discovered" at amateur night, they suddenly end up becoming back up singers for James "Thunder" Early (Eddie Murphy; Beverly HiIls Cop). At first, content to be in the background, things change when they get their big break. Effie, who is the best singer in the group, is switched to supporting singer behind Deena and she starts getting individualized attention causing Effie to become more and more jealous. As they become bigger stars, Effie continually does things to sabotage herself, eventually getting kicked out of the group altogether. When Deena gets together with Effie's boyfriend and the group's manager, Curtis Taylor, Jr. (Jamie Foxx; Ray) everything falls apart for Effie while "The Dreams" continue to have success. Dreamgirls is what happens when you have an amazing cast teamed up with a terrific director and an award-winning soundtrack. As the stars align and the planets converge, you can sense that this film is something special and it really is. Murphy embodies the 1960's soulful singer while Foxx is the smooth businessman who launches successful singing groups (the character is said to be based on Berry Gordy, Jr.). Knowles and Noni Rose are great for their parts and their vocal talents are fantastic but Hudson has the meaty role and is the clear scene-stealer every moment she is on screen. We alternately pity and despise Effie, ultimately relishing her triumph over her past. Hudson sent chills through me and not just when she was singing. Her performance is so powerful it is no shock that she won an Oscar. The Director's Extended Edition Blu-ray combo pack is presented in 1080p high definition video and DTS:X audio. The colors are sharp and bold in the girl's costumes while muted in other spots to represent 1960's downtown Detroit area. The black tones are true and strong which adds a depth to the production. The audio was actually a little disappointing to me as I didn't sense the true robust denseness of the orchestration and vocals across all the speakers. I also thought there were moments when the dialogue was too soft. 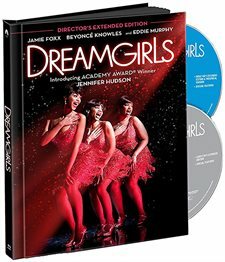 The Director's Extended Edition cut set not only offers fuller versions of the songs and some scenes, it also has never before seen footage of Jennifer Hudson's audition and screen test. It also has alternate scenes and a great photobook with wonderful pictures and select song lyrics. It can always be a tricky thing when adapting an award-winning musical into a feature film but Condon did an excellent job of it. Between the cast, the songs and the various angles he employs, the viewer is never bored or taken out of the story. The soundtrack alone should keep you engrossed but the costumes, sets and the aforementioned cast all combined to make one heck of a movie.